Our online class is designed to take 3 hours. All of the lessons are intended to prepare you to serve alcohol responsibly and do well on the 40-question state standardized exam. 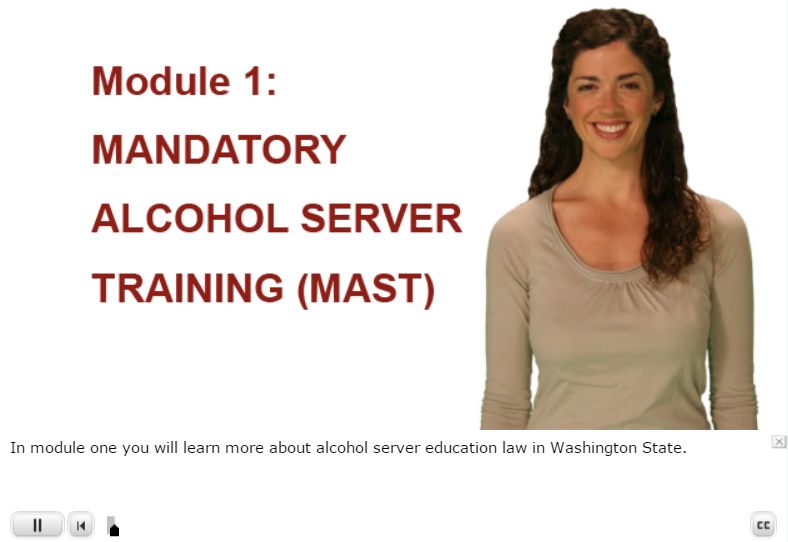 After you pass it (two attempts are offered, and we have a 99% pass rate on the first attempt), you will be issued a Mandatory Alcohol Server Training (MAST) Class 12 Mixologist or Class 13 Server Permit for serving in Washington State. Click here to see a sample lesson. The course works on iPad/iPhone and other tablets/smartphones, in addition to Windows, Macintosh, and Linux! If the lesson plays, you may stop it, because you have everything you need to complete the course. If so, you may proceed to the Enrollment Agreement. If the lesson does not play, make sure you are using an up-to-date web browser, such as the latest version of Google Chrome. To get started, click here to continue to the Enrollment Agreement.